THANK YOU for your interest in SOUTHERN TIMBERLANDS. My name is Will Calhoun. I am a graduate of The McCallie School in Chattanooga, Tennessee. I received a Bachelor of Science in Business Administration Degree (Marketing), from Auburn University. I left a job in the financial sector to pursue my dream career: helping individuals locate or market their own piece of Alabama. I have experience in the land, stock, bond, and futures markets, and understand the importance of each individual goals. From a financial standpoint, land is one of the best investments, because it has historically demonstrated strong returns. Additionally, land has an intrinsic value, which cannot be measured monetarily. Land is tangible. While each tract of land in Alabama is unique and has its individual attributes, every piece can be relished for its particular traits. Each tract can be enjoyed by hiking, camping, hunting, fishing, managing wildlife, or even something as peaceful as bird watching. Improvements and value can be added by building ponds, making roads and trails, planting food plots, rotating crops, and managing timber. My father, Uncle, and I have experienced many of these adventures with our own piece of Alabama, which have been some of our most memorable times. Just as we have enjoyed and made improvements to our property, I can help you see the potential in your prospective or existing tract of land. 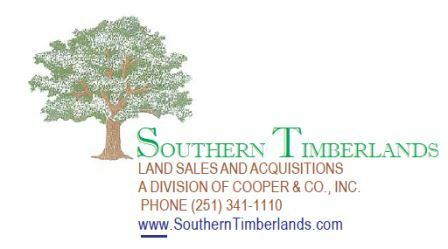 If you have questions about different ways to produce revenue streams from a tract of land, Southern Timberlands' experienced real estate agents can help you. Whether your interest is investing, developing, timber, game management, or simply recreational, we can extensively market your existing tract or find the piece of Alabama or Mississippi you wish to call your own.